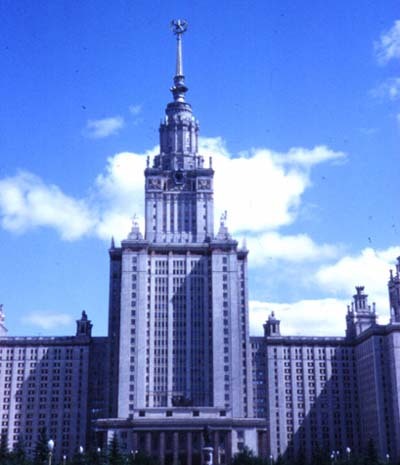 Moscow State University named for M. V. Lomonosov (1949-53). The university was founded in 1755 by its namesake and still has its older buildings downtown. Moscow University has at its disposal more than 600 buildings and facilities occupying over 1 million square metres, including the sky-scraper on Sparrow Hills, which stands 240-m (787-ft 5-in) tall and has 32 storys and 40,000 rooms, The University campus in Moscow covers 205.7 hectares.